Altars are places where the world of man and the realm of spirit interconnect. Here, higher powers are petitioned through prayer and ritual, spells are enacted, and offerings are made. Those who frequent forums, discussion boards, and social networking sites will often notice that the world ‘altar’ is often misspelled as ‘alter”, which is a pet-peeve of mine. However, upon further reflection, the word ‘alter’ means “to change” and in this respect I find this misspelling entirely appropriate as one’s altar is the place where change often begins. The subject of altars is one that often confuses those new to the practice of Hoodoo. One question that is often heard is “Is there a standard altar layout”, the answer to which is invariably “no”. Many believe that in order to have a proper altar it must be furnished with expensive equipment and materials, which is entirely untrue. Beyond a few basic necessities such as candle-holders, saucers, candles, mirrors (for reversing spells), incense burners, altar-cloths, and whatever statues or iconic imagery representing your personal faith, etc…there isn’t much that a practitioner needs in order to build an altar. Once the items are gathered, they are arranged on a flat surface such as a nightstand, coffee table, end table, bookshelf, etc… in a manner pleasing to the eye. My main working altar is arranged on top of a child’s chest-of-drawers in my dining room directly in front of my pantry. My herbs are lined up on the shelves of the pantry and the drawers of the bureau hold candles, altar clothes, incense, and other items I use in my practice. In addition to these, I have a dedicated space where I performed divinations and an area specifically designed to prepare and fix candles. However, I do not consider these areas to be altars. My main working altar is positioned in my home so that as I stand in front of it I face North with the West (setting sun) on my left and the East (rising sun) on my right. For this reason, I will often cast spells of a positive, or drawing-in, nature on the right side of the altar; and spells of a negative, or moving-away, nature on the left side of my altar. This right-side “good”, left-side “bad” corresponds to the European notions of the right-hand path and left-hand path of good and evil that I learned while studying Wicca and with which I am comfortable. The main working altar is the place where I perform spells and rituals that are not in alignment with the energy and/or purpose of the other altars in my home. Here spells for safe travel, protection, blessing, justice and retribution, etc... are performed. While in some instances spells of a diverse nature may be enacted on this altar at once, I usually reserve different types of spells for different days. For example, spells for protection and retribution are performed on Saturdays, while spells involving safe-travel are cast on Wednesdays. The Love/Money altars are used specifically for workings of Love and Money respectively. 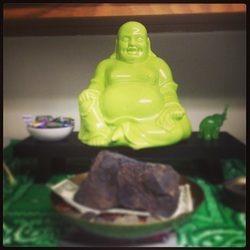 Therefore, all items placed on these altars relate to those goals. For example, the Love-Altar (above) stands on the top of my bedroom dresser with a beautiful, young man as the focal point. Above his head a sign incorporating Love Birds into its design welcomes helpful spirits. The candle holders flanking the statue incorporate hearts into their design and a pair of matched lodestones fed with magnetic sand can be found on the altar among condition oils, incenses, and love-drawing powders. The Money and Success Altar is on the top of my refridgerator and houses several objects related to wealth, prosperity, and success. They include a small statue of St. Joseph for success in one's occupation; Hotei Buddha, the luck-bringing demigod; and a Maneki Neko, who beckons wealth and prosperity. In addition, there are green candles, and a large lodestone resting on top of a bowl full of change and paper-money to draw in more wealth and prosperity. Other items include a piggy bank, an offering bowl, an incense burner, and a copy of The Prayer of Jabez. Altars are powerful and highly personal sacred spaces which can be erected for virtually any need or purpose without a great deal of expense. They can be as simple or as ornate as you like and you have a wide variety or choices in regard to altar size, number of altars, deities, and other items placed on the altar. Outside of these general guidelines there are no strict rules when it comes to building your altars and ultimately you will find that what is 'right' is what works for you.